Industry experts project the U.S. and Canada will need between roughly 30,000 to 60,000 additional miles of pipeline through 2030. In North America, more than 41,000 miles is expected for 2013. The domestic shale oil and gas revolution has caused this industry to explode. When it comes to choosing heavy construction equipment for the job, the right excavator can be the key to the success of a pipeline construction project. There are a number of criteria that a pipeline contractor should keep in mind when choosing an earth-mover. Pipeline contractors should talk to their dealer about their application to ensure they choose an excavator that has the correct specs. Highway Equipment Co. serves the Marcellus and Utica shale gas industry in Pennsylvania, Ohio, West Virginia and New York. In business since 1933, the company has established itself as one of the region’s leading rentals, sales and service providers. Highway Equipment is setting up many of its pipeline construction customers with Hyundai Construction Equipment excavators. For pipeline construction projects, Highway Equipment sells or rents its customers the following Hyundai excavator models: R210LC-9, R290LC-9, R380LC-9 and the R480LC-9. 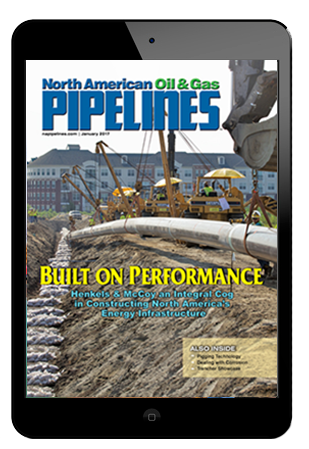 Pipeline contractors need auxiliary hydraulics to run attachments and single grouser bar track pads if the project requires climbing and descending in mountainous terrain. All of the excavators have cab guards and screens to protect the operator. Springer explains which attachments pipeline contractors need to use with their excavators. Convenience and comfort of the operator also are important differentiating factors between machines. Keep an eye out for these value-adding features like fully adjustable seats and armrests, large foot pedals, ergonomic joysticks, storage space, LCD monitor control, safety glass, automatic climate control, etc. When you look at the various lines available, Springer says, it’s important to look for models where these features and benefits come standard, rather than cost extra. 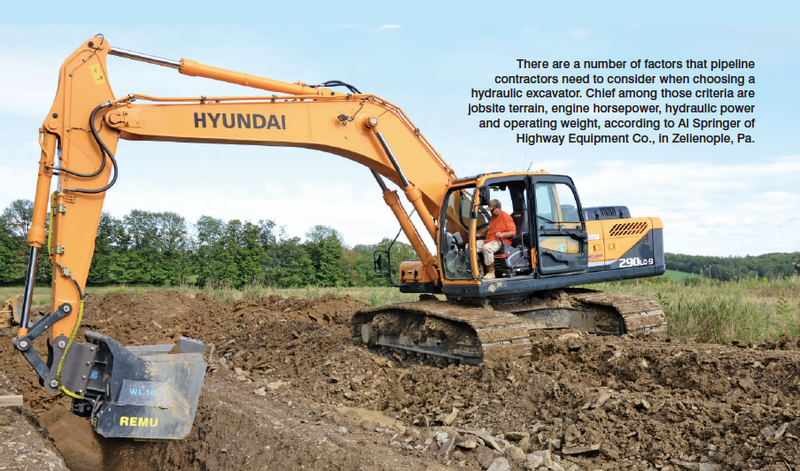 One of the features Springer appreciates on the Hyundai excavators is the Hi-Mate GPS system. Hyundai’s 9-series excavators come standard with Hi-Mate, Hyundai’s proprietary remote management system that provides operators and dealer service personnel access to vital service and diagnostic information on the machine from any computer with internet access. Users can pinpoint machine location using digital mapping and set machine work boundaries, reducing the need for multiple service calls. Hi-mate saves time and money for the owner by promoting preventative maintenance and reducing machine downtime. Equipment dealers offer a number of options when it comes acquiring a machine. The decision over whether a contractor should rent or purchase a piece of equipment requires a careful evaluation of a few considerations. Pipeline construction involves numerous challenges. Having the right equipment can go a long way in ensuring a project’s success. Pipeline construction contractors can benefit from the support and resources of Hyundai’s dealer network. Hyundai’s expansive network has multiple locations across the Americas. Hyundai dealers are fully trained on the machines, parts, specs and usage and are proven to be a valued resource for the pipeline construction industry, from the purchase decision maker to the operator out in the field. Jaselle Spencer is a sales and marketing specialist with Hyundai Construction Equipment Americas Inc.